Leftover from a recent post on the Mexico Oil Shock Model, a few nagging questions remain. At the time I remarked on a curiosity within the oil discovery profile from ASPO. 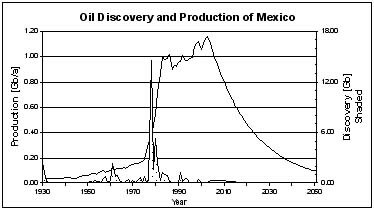 As you can see below, the peak discovery appears around 1979, yet all references point to the discovery of the massive Cantarell oil field in 1976 (including production start that year!). As the oil shock model requires "fallow" and "construction" periods as parameters, and the discovery profile essentially squeezed this time frame to virtually nothing, I believe I goofed on choosing a typical value of 5 years for these two parameters. As a by-product of selecting these numbers, I had to make the oil extraction shocks in the early 1980's much too high to fit the historical oil production profile.